The most moving story about a Canada Goose! Nobel Prize laureate Konrad Lorenz is the author of this book, the best book written about geese! The lake near City Hall in Helena is quiet now. There are no ear-splitting honks, no loud shrills to break the monotony. The big, white Asian swan goose which for years called Tucker Lake home is gone - found dead a few weeks ago near the cemetery he also grazed, a pair of goslings by his side. He would have liked that, knowing the 8-month-old babies were there at the end. He was the lake's resident nanny, helping two sets of Canada geese parents raise their young, whether they liked it or not. 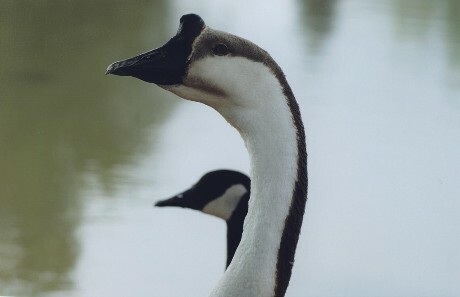 Over the years, he had become almost an institution in Helena, a legend among geese who controlled both the lake and its inhabitants - human and otherwise. I called him King, but he was known by other names. Some referred to him as the "leader" goose; others Noisy because of his high-spirited honking. Barbara Self and Evelyn Hedrick of Alabaster referred to him as "the old granny" because of his affinity for the young. We joked about his gender. I thought him male because his behaviors were similar to those of the ganders - protective and assertive; yet I couldn't dispute his gentleness toward the babies. 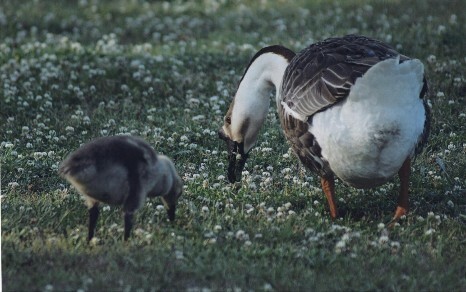 Occasionally, the Canada geese dads would cuff their offspring to keep them in line, but King was always gentle, generously sharing his food with the goslings, if not giving it up to them entirely. He was quite large, at least twice, perhaps three times, the size of a Canada goose, mostly white with pumpkin-colored feet, brown wings with matching stripe down the nape of the neck and a conspicuous black knob at the base of the bill. He seemed a domesticated version of a swan goose, or something or other. No one knew for sure. 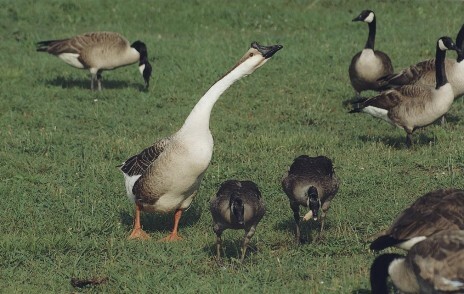 John Hadidian, suburban wildlife director of the Humane Society of the U.S. in Washington, D.C., thought him an African goose (a relative of the Chinese goose). Whatever, he was gorgeous, with an enormous following among residents of Shelby County. Visitors brought him treats. Children adored him. People flocked to watch him perform. He used to swim to the sandbar near the bridge, nudging off anyone not part of his entourage; then dance around like a ballerina, spreading those slow, glorious wings in some sort of celebratory rite, a dozen Canada geese cooing in chorus, an avian version of "Swan Lake." Visitors would gather on the bridge and watch in awe. It was like being a spectator at a zoo. I probably knew him better than anyone. He hung out with Zoey, a Canada goose whose behaviors I'd been studying for six years, and her mate, Dad. Everyone thought their babies were King's, but I knew otherwise. Every spring, the parents would go off to nest, reappearing several months later with day-old goslings that King would adopt. The parents knew it was futile to object. Only once do I remember an altercation. The year before last, the parents apparently decided they could raise their goslings on their own, and Dad and King went at it in throat-to-throat combat. The swan goose won, of course. His size alone was enough to dissuade any prospective combatants. However, after that, the two became steadfast friends, something I couldn't help considering in light of the recent Israeli-Palestinian conflict. Two grown geese setting an example for the rest of the world. Resolve your differences, and then live in peace. No one knew how or when he came to the lake. Mike Wooten, an artist from Alabaster, thought he'd been here at least 15 years. I remember him from about 1990 when I began walking here," he said. "We called him Stub because his wings were short. He'd fly low over the lake but couldn't go higher." That inability to sustain height cost him emotionally. Eventually, the goslings had to be taught to fly, and that meant King was left behind. He'd fly low across the lake with the family and then honk in despair when he couldn't follow them into the night. He was restless in their absence, but the reunions were something to behold. Zo and Dad would begin voicing their arrival from half a mile away, and King would honk them in, swimming over in a great rush. Once I was with him on shore when they flew in. To my astonishment, the family practically landed at our feet, enveloping us both in a sea of feathers and unrestrained joy. We're left with memories, those who loved him, watched his antics or fed him over the years. Debra Jo Carter, who was formerly with the city parks department, remembered the time she'd run into King one morning on her rounds and had difficulty enticing him to move elsewhere so she could work. "He would strut those shoulders as if to say, `I'm the boss around here,' " she recalled, laughing. Occasionally, we had differences. Last year, when Zo returned from nesting, she swam the day-old goslings over for introductions and cracked corn. King came along, hissing his objections to my being allowed so close to the newborns. "They're not even your babies," I reminded him. Then I stood perfectly still, letting the goslings get my scent, allaying their fears and apprehension, a tactic I had learned from observing King bond with newborns. His body was found by Karen Rosenow of Helena, a photographer who'd been taking pictures of him over the years. She'd gone to the lake to photograph him and found him dead. She said the body showed no sign of trauma. Days later, the lake still isn't the same. Maybe it never will be. The goslings seem to miss him the most. Their nanny slept between them, one on either side, and some evenings I catch them looking off into the distance as if they think he's suddenly going to emerge from behind one of the tombstones. In time, the sadness will subside. The goslings will go back to being their bratty selves, and the dozens of Canada geese that fly in expecting brief reunions will cease waiting for his great bulk to appear. But for now, his spirit is everywhere. I'll be walking and suddenly hear the faint beginnings of a honk and instinctively look up, thinking it's him, and then I'll remember ... it can't be him. It is worth noting how attached we can become to a creature of the forest, who reminded us, in this case, of that which is absent from our lives, by allowing us to observe the almost human-like interactions of wild geese - private moments between goose and gander ... the extraordinary sense of family ... the clamorous honking - and not feel privileged to have known this celebrated community goose if only for a while. Mary Lou Simms is a free-lance writer from Helena specializing in wildlife issues, currently working under a national reporting grant. E-mail: MLSimms123@Yahoo.com. Hands off my resident goose pal Zoey and me! SHOP FOR CANADA GEESE BOOKS AND MORE!